Marvel’s Guardians of the Galaxy Season 2 will follow Star-Lord, Gamora, Drax, Rocket, and Groot on a mission to protect Star-Lord’s home planet of Earth, when they cross pass with Earth’s Mightiest Heroes, the Avengers. After an epic battle, the two teams come together to save Earth from an alien mad scientist, The High Evolutionary, but inadvertently unleash an ancient weapon. With every alien baddie in the galaxy after this weapon, the Guardians must unlock its secrets before it destroys them and everything they’ve sworn to protect. 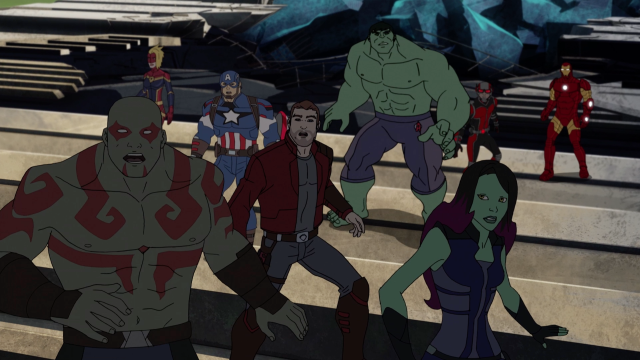 The series stars Will Friedle (Boy Meets World) as the quirky leader Peter Quill/Star-Lord, Trevor Devall (Johnny Test) as the temperamental, tough-talking Rocket Raccoon, Vanessa Marshall (Star Wars Rebels) as the unparalleled warrior Gamora, David Sobolov (Transformers: Prime) as the rough-edged warrior Drax the Destroyer, and Kevin Michael Richardson (The Cleveland Show) as tree-like humanoid Groot.